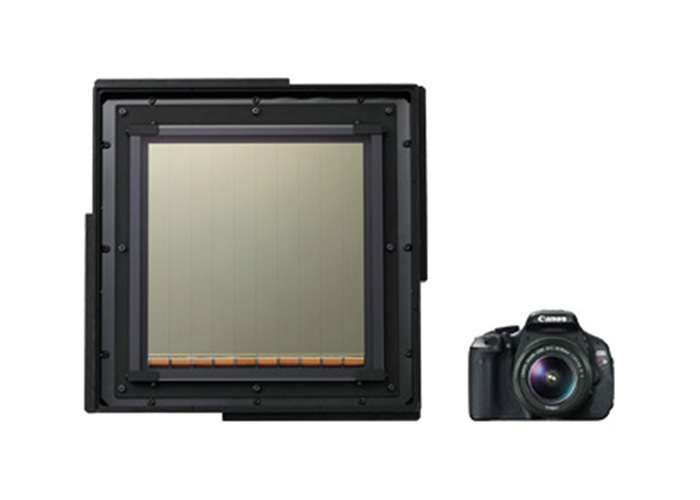 In 2010, Canon revealed that it was developing the world’s largest CMOS sensor, one measuring about 40 times larger than a full-frame CMOS sensor. The company has now added more details about the project to its website, including a discussion of a real-world application. Increasing the size of CMOS sensors entails overcoming such problems as distortion and transmission delays for the electrical signals converted from light. To resolve these issues, Canon not only made use of a parallel processing circuit, but also exercised ingenuity with the transfer method itself. Overcoming this problem allowed comparatively fast readout of the sensor’s huge pixels, allowing it to capture video at 60fps in conditions as dark as 0.3 lux, which is about as bright as a night scene illuminated by the moon. The company says the sensor has already been used by Japan’s Kiso Observatory to capture the first ever video of meteors that otherwise would have been too faint to record. This allowed analysis of the meteor frequency, providing supporting evidence for a theoretical model of meteor behavior. Canon also suggests the ultrahigh-sensitivity sensor could be used for various other applications requiring video in extreme low-light conditions, such as studying the behavior of nocturnal animals or shooting video of aurora.